The OnePlus 5T Star Wars Limited Edition model was launched in the Indian market ahead of the release of Star Wars: The Last Jedi, the latest installment in the movie franchise. The new OnePlus 5T variant is the most expensive OnePlus smartphone in the country yet, and features a few customisations that distinguish it from the standard version of the handset. These include a white back panel with a Star Wars logo on it, a red Alert Slider, 10 preloaded wallpapers, and other software customisations. The company has also bundled a rugged case with the OnePlus 5T Star Wars Limited Edition, one that is designed after Kylo Ren's helmet from the movie. 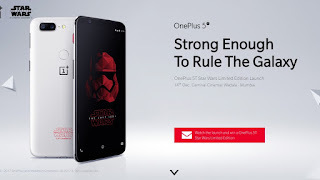 As for availability, the OnePlus 5T Star Wars Limited Edition went on sale from midnight (12am IST) of Friday, December 15 - the same day that Star Wars: The Last Jedi released in the country - via Amazon India and OnePlusStore.in. It will also be available via OnePlus Experience stores in Bengaluru and Noida, while stocks last.